LEED certification move over! Sustainable design’s new cutting edge program is called The Living Building Challenge. Developed by the Cascadia Region Green Building Council, the aim is to push the industry to adopt stauncher environmental practices. The system is based on 16 mandatory design prerequisites (not credits), however there are some exceptions made based on current market limitations. Many factors including site selection, materials and a healthy air source control are taken into consideration when facilities are being considered. One prerequisite indicates that appropriate materials such as glass and concrete must be up to 80% recycled, metals as high as 95% recycled. Another perquisite states that materials and services must come from suppliers within an appropriate mile radius of the proposed Living Building facility. Materials such as glass, stone and metal fall into the 250 to 500 mile radius. 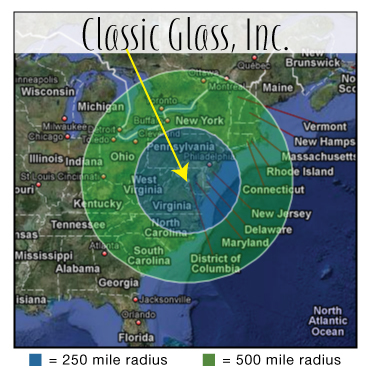 Below is a map indicating Classic Glass’s location in relation to this zone radius. This entry was posted on Monday, October 26th, 2009 at 9:53 am	and is filed under Decorative Glass. You can follow any responses to this entry through the RSS 2.0 feed.Both comments and pings are currently closed.